Today is the last day of June, 2016. Tomorrow in all of Canada, our country will celebrate its birthday. My Canadian flag is ready to be proudly hung. In Newfoundland & Labrador, however, July 1st also marks a much more solemn event. On that day, one hundred years ago, during the early part of World War 1, the Dominion of Newfoundland, a British Colony, lost a huge portion of an entire generation. The members of the ‘Royal’ Newfoundland Regiment at Beaumont Hamel were tragic casualties in the first day of the Battle of the Somme in France. July 1st is Memorial Day for us in Newfoundland & Labrador. Following World War 1, the people of the province chose the forget-me-not as a symbol of those who gave their lives and sacrificed so much for all of us. 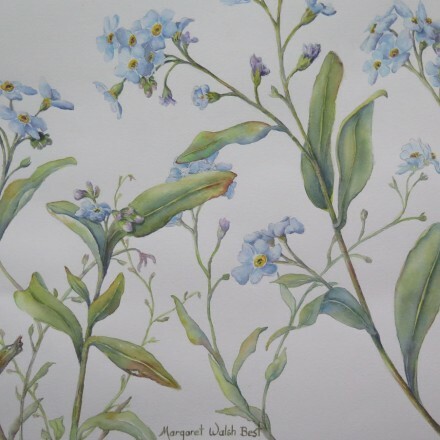 I feel very pleased to have had my watercolour painting of this hardy but delicate plant selected by The Historic Sites Association of Newfoundland & Labrador (http://www.historicsites.ca/ ) for use on commemorative products related to World War 1. 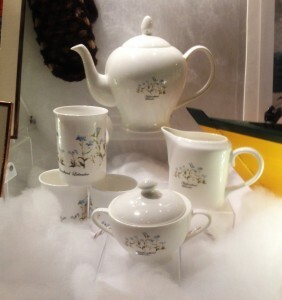 Currently available is a limited-edition collection, a mug with a tea pot and sugar and cream pieces, all in bone china at Heritage Shops throughout the province – http://www.historicsites.ca/store-locations/ . You can see these and more images of the pieces at https://heritageshops.ca/collections/remembrance/products/ . I am happy to have done a small part in remembering and celebrating those whose actions and sacrifices touched us all. The original 22 x 30” watercolour painting will be on exhibition at the Water Street Gallery 2nd floor of The Heritage Shop, 309 Water Street in St. John’s, NL, from July 10 to August 27th. I wish you well as you commemorate and celebrate on July 1st and during the years to come. Check back in a couple of weeks with news about upcoming summer exhibitions, workshop and classes at home and abroad in 2016 and an Art Vacation on the island of Madeira, Portugal in 2017.